Following on from last issues impending confrontation with the LRA, issue 6 of the ‘Unknown Soldier’ does not hold back, as Moses seeks out the LRA lieutenant, Ilakut, ‘the lieutenant of children, as Moses scornfully describes him. When Moses catches up with Ilakut, it is a bloody and desperate fight, but the outcome is never in doubt. Whatever Moses has become, it is in the guise of the ‘Unknown Soldier’, and that is a terrifying, even terrible prospect. 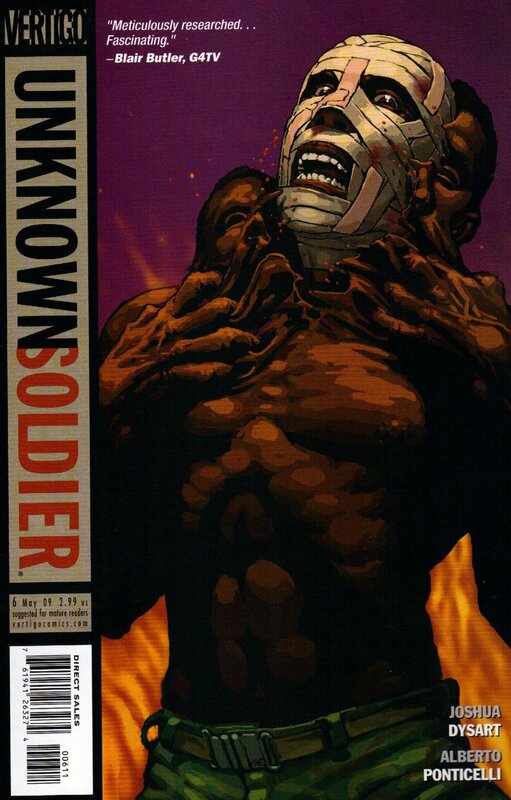 The ‘Unknown Soldier’ is an efficient and brutal killer, his sole purpose is seemingly to take down the Lords Resistance Army for their heinous crimes, particularly the abduction of children for forced conscription into the LRA. Throw into the mix the continuing presence of Agent Howl, and a snooping journalist, and the layers of intrigue mount up on top of the visceral action. There are some horrific and heart-rending scenes as the LRA lay waste to a village. The art does not hold back from showing the horror of war but does not glorify it or in any way celebrate it (a refreshing change, and in this context entirely appropriate). By the end of the issue Moses is a man with the scent of blood in his nostrils and the single minded clarity of a man with a clear purpose. We shall how this develops over the next few issues. The ‘Unknown Soldier’ is truly a title to savour, and for the uninititated, one to watch out for. Joshua Dysart’s ‘Unknown Soldier’ continues to provide an intelligent, insightful and thrilling antidote to the mainstream. This book deserves a wide audience. It is a thriller and a lesson in Western World / African politics and the dreadful wars fought within that continent. Dysart is adept at making this title a taut action thriller while delivering valuable information on what has been going on in Uganda and the DRC over the last 20 years. The fact that he devotes a page of written text at the back of the book to fill in the gaps and give a fuller perspective on what you are reading only underlines the commitment he gives to this endeavour. I have praised this title before, and I shall continue to do so. This is an important comic book, but more than that, it is an entertaining and informative comic book. It makes you think, it makes you feel. There can surely be no further purpose for a comic book than to achieve those objectives? Unknown Soldier #6 is out now from Vertigo Comics.